Les Chalets de Marie is in la Panthiaz, la Chapelle d’Abondance, which is in the Haute Savoie and part of the Portes du Soleil ski area. Our spacious 2nd floor, 2 bedroom apartment has an open plan living/dining/kitchen area (with sofa bed), a double bedroom, a twin room, bathroom and separate toilet. It is comfortably furnished, with ample kitchen and dining equipment for your stay, and doors from the living area opening onto the balcony offering amazing views of the mountain behind. This catches the sun in the morning, so it’s perfect for enjoying breakfast outside! The large six seater dining table has plenty of space for you to enjoy a home cooked meal after an active day out in the mountains. There is a secure storage room on the ground floor, off the main entrance to the building, for you to store ski boots/ski’s, and we have a garage at the back of the building for storing bikes/bike boxes. 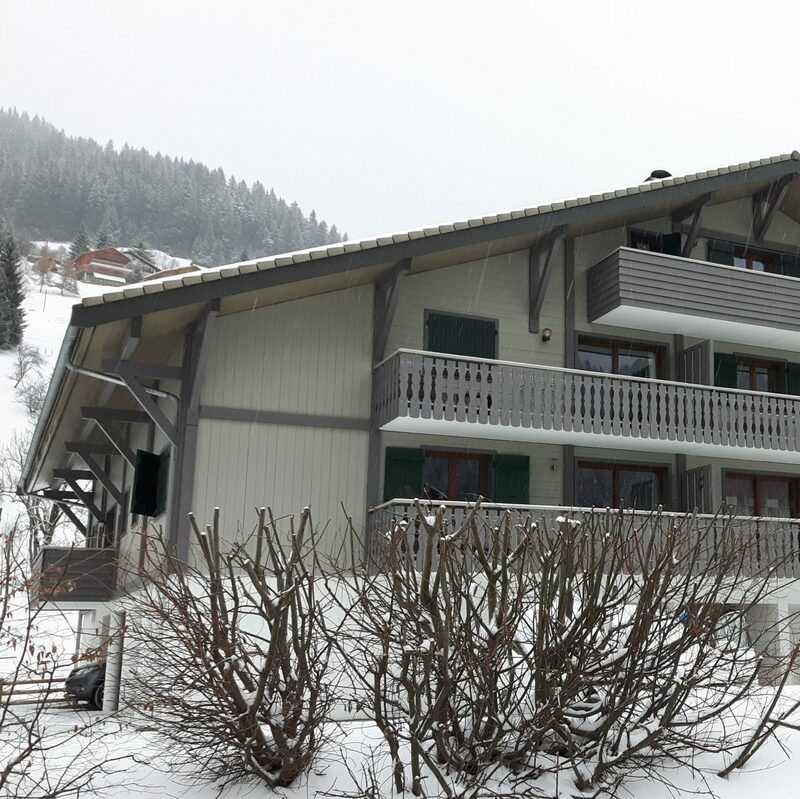 Situated less than 100mts from ‘La Panthiaz’ telecabine, you have direct access into the 650km Portes du Soleil ski area. From here you can easily connect to the Swiss part of the ski area, and also round into Chatel & Avoriaz. There’s also a free ski bus stop 50mts away, that can take you either to Chatel/Pre la Joux or to the small ski area at Cret Beni in la Chapelle. Summer is just as active as Winter in la Chapelle and there are many more activities on offer like road cycling, mountain biking, white water rafting, rock climbing, fishing and hiking. We’re keen cyclists so our garage is dedicated to bike/bike box storage, so there’s no issues with bringing your bike/s from home. There are plenty of famous cols in the area to tackle, including the Col de Bassachaux and Col du Corbier. If you head over to the next valley you can reach the Col de la Joux Verte, Avoriaz, Col de Joux Plane, Col de la Ramaz, Col de l’Encrenaz and many more. If you’re after a slightly flatter ride you can always make your way down to Lac Leman for a beautiful route around the edge of the lake. La Chapelle is a beautiful, authentic Savoyan village at 1020mts altitude, between Chatel and Abondance, approx. 90mins drive from Geneva airport. There’s plenty of choice for restaurants & bars in the village, all within walking distance, but we particularly recommend le Fer Rouge, which is a micro-brewery and Atelier Jacky, which are both only 5mins walk from the apartment.